Tiger Muskellunge are a sterile hybrid cross between a Northern Pike (Esox lucius) and a Muskellunge (Esox masquinongy), with intermediate	characteristics between the two parents. It has a very elongated torpedo-like body. Its most	notable feature is the grey-green vertical bars along its sides. It thrives where there are good numbers of perch and sunfish for food. It can be expected to grow to 50-plus inches long and weigh over 30 pounds. Because the tiger muskie is a hatchery-produced hybrid, it does not occur naturally anywhere in the world. The tiger muskie has been a boon to Utah fisheries management. Tiger muskie grow to be very large, and they are extremely effective predators. 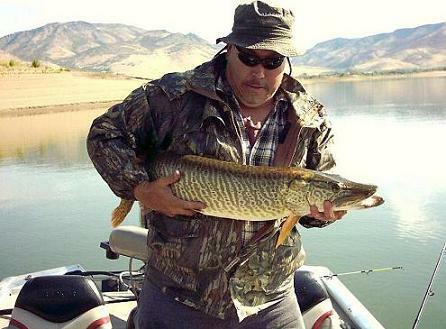 Tiger muskies are quickly becoming one of the most popular fish in Utah. Not too many years ago, nobody had even heard of a tiger musky. Now, there are several reservoirs stocked with them, and the DWR has begun the process to begin raising Tiger Muskies at a new warm water hatchery in Salt Lake County at the Lee Kay Center for Hunter Education and public shooting range just north of State Highway 201 at 5600 West. Pike from Recapture Reservoir will be bred with Muskellunge from Minnesota at the new hatchery to produce Tiger Muskies for stocking in Utah Waters. The tiger muskie's predatory skills have enabled it to drastically reduce populations of stunted perch and other panfish in several Utah waters. Remaining panfish are able to grow to larger sizes, which pleases anglers. Additional benefits from tiger muskies stem from the fact that tiger muskies are sterile. Because tiger muskies do not spawn, the Utah Division of Wildlife Resources can closely control the number of tiger muskies in a lake at any one time. Also, because tiger muskies do not put any energy into reproduction (such as energy for egg production, finding a mate, and so on), they grow more quickly than they otherwise would. The tiger muskie is a "lie-in-wait" predator that will often stay hidden in weed beds until a fish or other prey item moves into range. The tiger muskie then lunges out of its hiding place to grab and devour its prey. ALWAYS check the current fishing guide for current regulations. Muskies are often called 'The fish of 1000 casts'. The same label is often given to their hybrid cousins, the Tiger Muskies. There is a reason they are called that. It can be frustrating and difficult to locate Tigers and get them to strike. Tigers can be caught using large spinnerbaits such as those used for big largemouth bass, as well as large jointed crankbaits such as are made by Rapala.